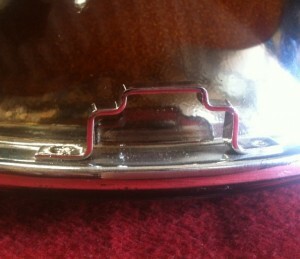 These have been out of stock at BMW for several months now. Back on the shelf and ready to be shipped anywhere along with the rear, if needed, too! $69 each. 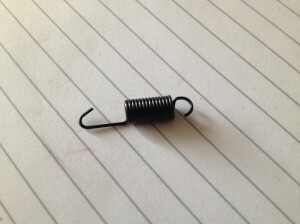 Have a broken or worn spring on the inside of the ‘tuna can’ of your tii? BMW no longer makes this spring, so we did! $25. 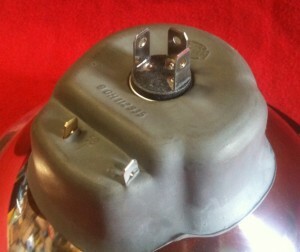 Differential reinforcement box for your damaged (or undamaged) differential mounting points. Choose the option with no welded nuts for an undamaged car that you want to reinforce, or the one with welded nuts for the mangled one that needs repair! 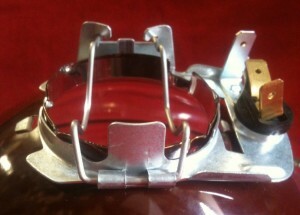 Custom manufactured locally in California. 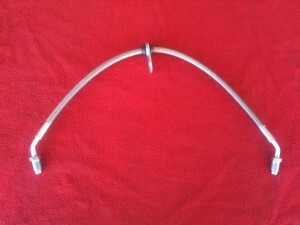 For the past year e9 control arms have been unattainable worldwide. 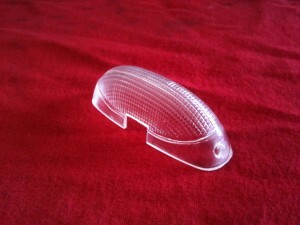 BMW was out of stock and our most favorite aftermarket supplier also ran out. 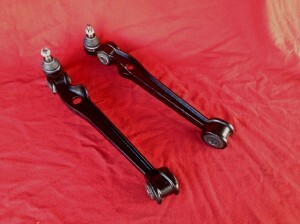 Now back in stock are the Ocap control arms to fit your 3.0cs! 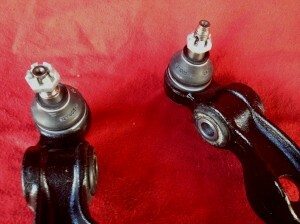 While the bushings are serviceable on the existing arms in your car, the ball joint is one with the whole assembly. When the ball joint is done, the jig is up! These arms are of very high quality and in our experience have been up to the test for year after year of use. Priced very reasonably at $110 each, this may be the best money you’ve ever spent to tighten up the suspension in your vintage BMW! If you’ve tried to buy new fuel injection tubes for your tii in the last few years, you’ve probably found that the #1 injection tube you received from your parts source was wrong! 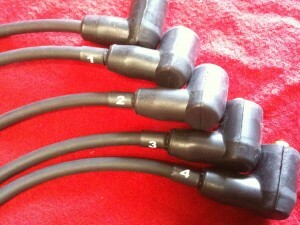 BMW has incorrectly superseded a black, unformed fuel line that purely will not work on your tii! Seeing a need for injection tubes that match for our customer’s restorations both in house and elsewhere, we found a source for custom made tubes and had complete sets made! 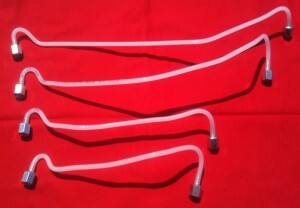 Using original injection tubes from BMW, these have been carefully modified to make for better clearance and more accurate curves to bring the beautifully flared ends from the Kuglefischer to the injectors on the manifold, making installation easier and completing the clean look of the engine bay of your restored tii! Price for a set is $255. Sorry, no single tubes available. 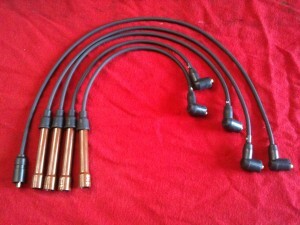 Tired of the old and tattered looking wiring harness in your engine bay, underdash or trunk? 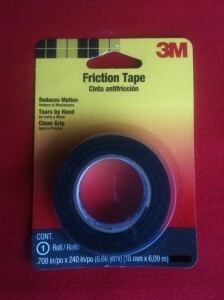 This friction tape is the answer to your problems! 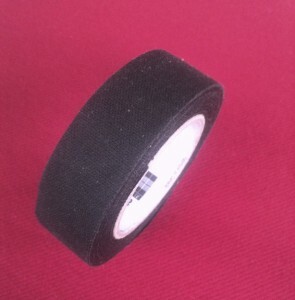 If you’ve ever tried to find the original type of single-sided friction tape, exactly as the old tape you remove from your wiring harness, you’re probably found that the only cloth tape available is double sided, much like hockey tape. This tape has no adhesive on the outside but sticks to itself like gangbusters when wrapped around wiring, and it won’t leave a sticky residue on that freshly painted engine bay or valve cover either! Don’t be fooled by similar looking packages from 3M, this tape is only one we’ve found with single sided adhesive. $13 per double sized roll. Finally available! An answer to the vintage E9 owner’s search for a proper tool kit for your cs, this unit is stronger and thicker than the original items that originally came on the cars in the 70’s. 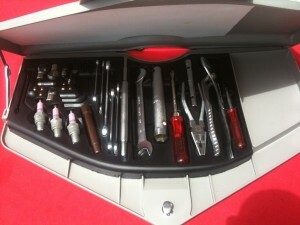 The box includes a brand new foam insert for keeping the toolkit organized in your trunk. Pictured here with a full set of tools installed. $395, brand new. 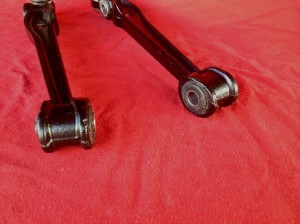 Update the suspension on your 2002 with a set of Moog ball joints. Although the ball joint is a hearty component of the suspension set up on an 02, they do wear out and cause sloppy steering and premature tire wear. 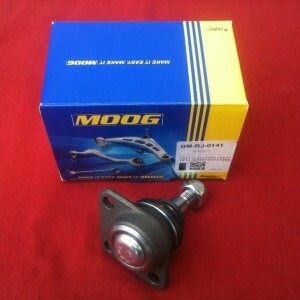 Other suppliers may offer a similar part for less, but the quality is found here with the Moog ball joint. 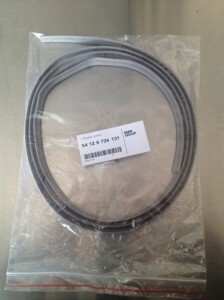 Moog (a subsidiary of Federal Mogul) is one of the top end manufacturers for suspension components of numerous makes and models and has been supplying these parts for BMWs for years. $29 ea. 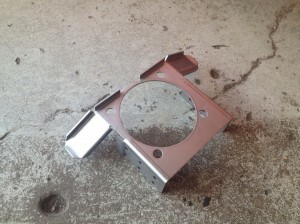 A common question mark among the 5-speed conversion procedure is how to efficiently connect the clutch master cylinder to the slave on the transmission as BMW never produced a hose to connect the two together with the needed length. 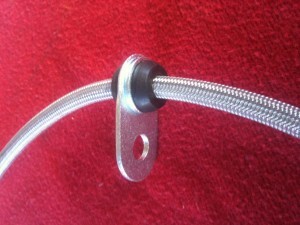 Designed for use on the street or race track, we now offer this custom stainless steel braided hose to connect the two directly to one another with a single piece. Utilizing carefully chosen angles on the connections at the ends, this hose will fit beautifully the the cramped space on a 2002 with a 5 speed crammed in! 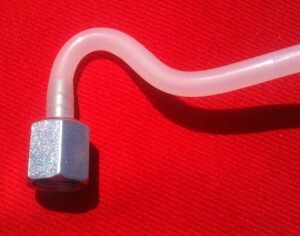 This hose is DOT approved and features a centrally located bracket for securing the hose to the transmission to prevent chafe during normal operation. 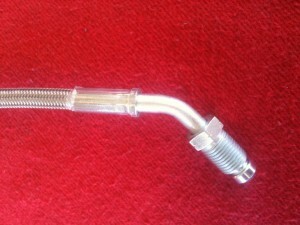 This hose is a steal at $28, and also is a part that has never been available from BMW! $44 ea (web special). Yes, believe your eyes! 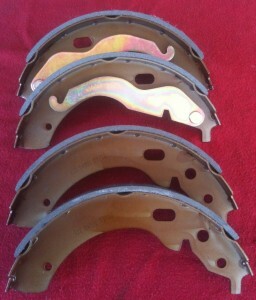 This is a complete set of rear brake shoes for any 2002. Don’t be fooled by other vendors selling them for less; other lower priced options are for only one or two shoes! 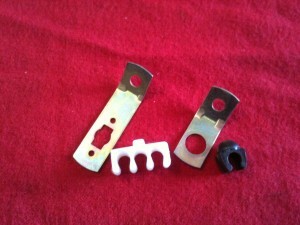 Priced reasonably at $45, this brake shoe set comes with 4 shoes, two of which include a brand new hand brake lever arm. Made of high quality braking compound, we’re sure you’ll be pleased with the quality of these fantastic shoes! 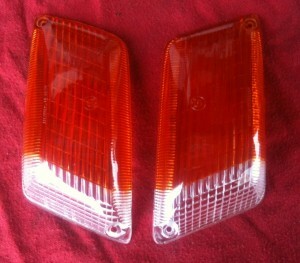 **Note: these will not fit your 1600. If you require 1600 brake shoes please contact us to specifically request them. ** $45 per set. Want the Euro look for your ‘02 but don’t want the hassle and expense? Use our direct drop-in replacement original Hella lenses with enclosed city lights to achieve the look with your existing US style buckets! Simply installed at home on your US 1600 or 2002, these lights take the place of your sealed beams and give you the look and advantage of the European H4 lens without sourcing all the hard-to-find parts needed to complete a European headlight conversion. Just install the H4 lens into your car, add wires from the side-marker in the turn signal to the city light and you’ll be motoring away with the European appearance of city light and extra-bright low & high beams! $125 per pair. 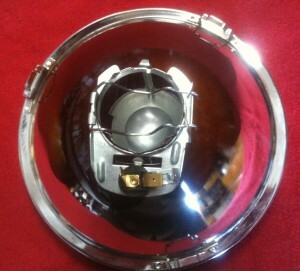 Once again we have produced a long since NLA and heavily sought-after lens for your vintage E9. Exacting in construction much like our US reproduction lenses, these are a fantastic example of the original Sidler Italian two-tone turn signal lens in the European (shallower) cross section. Set your coupe apart from the competition at the next Clean Car show with a pair of new and shiny turn lenses like no one has ever seen! In stock and priced per pair only, these are a steal at $178. Get yours today in time for your next group drive! These lenses have been unavailable for years! 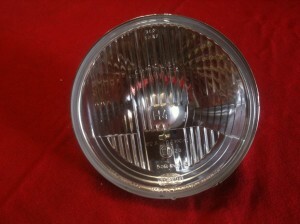 Using our last remaining original lens, we had this lens custom remanufactured to fit the very special (and rare) dome light found on the center console of a 1600/2002 convertible right in front of the shift lever. Spruce up that tired old dome light for only $49.50. Order today and we’ll include a brand new bulb free of charge! 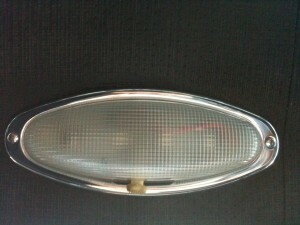 (Matches part number 63 31 1 353 177 or 63 31 9 055 589). 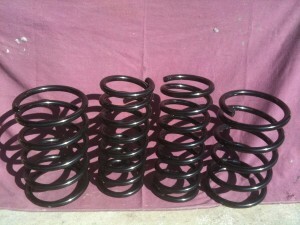 La Jolla Independent Special 3.0cs Lowering Springs–Now in Stock!! These springs have been custom wound in order to lower the front and rear while not over-stiffening the ride of your vintage BMW. 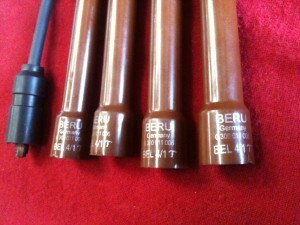 A favorite item among our coupé owners, these springs are track tested and passenger approved. 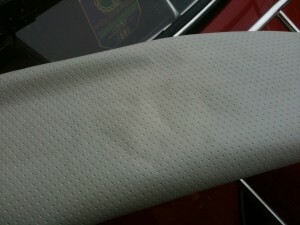 Newly available ORIGINAL material for the headliner of your E9 Coupé! 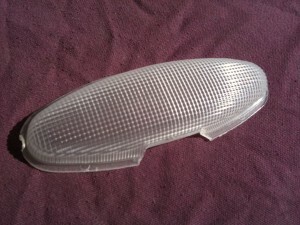 Matches BMW part number 51 92 1 802 983. 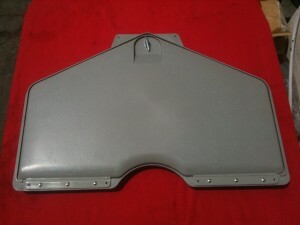 Currently $75 per square meter, and you’ll need 3 meters for your sunroof car, or 2.5 for your non sunroof car (includes enough to recover the header panel at the top of the windshield as well). Stock is limited so call or email now! 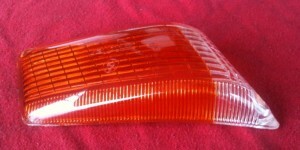 (We also have csl headliner material in small quantities). Factory original trunk panel material to recover those worn out and discolored trunk boards in your 2002 or E9 of any vintage! This material is the best match we have ever found to the material found originally on the various trunk panels in your vintage BMW. Price is $139 per square meter, about 3 meters needed to redo the whole trunk. Matches part number 51 95 1 811 281. Stock is limited so call/email and order today!